The second week of training really kicked things into high gear and Danson and I had a lot of hard work to do. It isn’t easy trusting a new guide dog and learning their personality, and hoping that they like you enough to want to work for you. The whole training process is not only physically tiring but more than that it is emotionally exhausting. The Sunday of training we were so lucky to be able to attend the Remembrance Day service in Ottawa near Parliament Hill. This was my first time attending and there were thousands of people everywhere. I know for me anxiety creeps up when I am going somewhere new and now you add in a brand new guide dog and you better believe that I was on edge. Photo Description: Black lab sitting in harness on the sidewalk with the parliament buildings behind him in Ottawa, Ontario. This was a great opportunity for me to be a part of a memorable service that I am so grateful to have been given the opportunity to attend but also to see how Danson would do in large crowds and navigating a large event like this. It was cold and he rocked it, I was able to walk through the crowd with a lot of excuse us, pardon me as he found the straight line and kept us moving in the right direction. It felt so good to be able to navigate a crowd like that with him. When he was working so well and really just rocking it like there was no worry about the people, I could feel myself calm and my confidence start to build and it felt amazing. They did a fly over at the ceremony and there were also bag pipes so it was great to see how Danson would do in an environment with those kinds of noises and of course he did great. On Monday there were many firsts for me again and I was so nervous going in and for good reason! We hopped on the train in Ottawa and went to Montreal. This was my first time going to Montreal and I am again so thankful for the experience. We did some work around down town and were working again in an unfamiliar environment and Danson did great. Then the highlight of the day came the big event, (well for me). We met up at the Subway and were going to take the Subway around the city to expose ourselves to it and see how our dogs would work in that environment. Photo Description – Photo 1: front of the Via Rail train on the tracks approaching the camera. I have never been on a Subway, I live in Saskatchewan I mean the closest thing to being on a subway we get is driving a tractor down a grid road. So needless to say I was nervous. When we entered the subway station I was met with a huge amount of people all in such a hurry that I am sure they were all heading to some sort of emergency and then I the sound of the subway coming in came. That was a new experience for me and I can tell you right now that that sound erased all sense of where I was for me. It was so disorientating it was like everything around me disappeared and it was kind of terrifying. Just as I would get my bearings back and feel a little better another train would come in. I hated every minute of it. Photo 2: black lab sitting looking at me as I sit on a bench and look down at him. **Photo Credit to CNIB Guide Dogs. Kudos to those of you who do this on a regular basis, this is not for me and I would be good if I never have to do it agin. But I did learn that Danson is not fazed by it at all and would be able to get me where I needed to go in any situation. The rest of the week was filled with light rail rides, bus travel, indoor work in the mall and more routes around Ottawa. 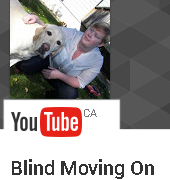 With the support of the amazing CNIB Guide Dog team I was able to really learn how Danson works and learn to trust him and listen to what he is doing. The support that the trainers give is invaluable and I will forever be grateful to all trainers and what they are able to do with the dogs but also what they are able to do with the clients and how they can make the transition to a new dog feel like it is so seamless. On Thursday November 15th 2018 Danson and I did our qualifying walk with the program manager and we passed and it felt amazing to know that through all the emotions and hard work we were able to come together and work as a team. Training did not end there we had one more week to go. The second week of training for me was probably the hardest and I found myself up and down and really on a emotional rollercoaster. I felt nervous at moments, terrified at others, ecstatic and everything in between. I was also struggling with the emotions of getting a new dog after losing another. I found myself almost getting scared to go home because I didn’t want to have to put myself in a situation where I would have to retire another dog because of someone else’s impatience or stupidity. And to this day I am still struggling with that, those emotions are still very raw and real; and most of all hard.